Danielle Spagnuolo of Wyoming, a speech-language pathology graduate student at Misericordia University, received the 2019 Von Drach Memorial Scholarship from the Pennsylvania Speech-Language Hearing Association (PSHA) at the 60th annual PSHA Convention in Lancaster. Misericordia University speech-language pathology students have received 11 out of the last 12 Von Drach Scholarship awards. The scholarship is presented annually to an outstanding student from one of the state's 14 speech-language pathology academic programs in honor of Dr. Robert Von Drach. Recipients are students who exhibit strong leadership abilities, outstanding academic performance, exceptional clinical skills, and scholarship within the profession. Spagnuolo's interest in the specialty field of communicative sciences and disorders began as a client. During childhood, the daughter of John and Cyndi Spagnuolo misarticulated the "r" sound, affecting the intelligibility of her speech and ability to communicate effectively in social situations, according to the essay she wrote for the Von Drach Memorial Scholarship Committee. A family member's recommendation to seek therapeutic services at the Misericordia University Speech-Language and Hearing Center for speech anomalies addressed the articulation disorder and identified her career path and college. Spagnuolo has participated fully in her academic career at Misericordia University, as she enrolled in the Honors Programs and has been an active member of the Pennsylvania Speech-Language-Hearing Association and National Student Speech Language Hearing Association. In addition, she has collaborated with mentors Professor Cari M. Tellis, Ph.D., C.C.C.-S.L.P., and Professor Glen M. Tellis, Ph.D., as a research assistant on numerous scholarly research projects and presented 30 research papers – 12 oral and 18 poster presentations – at state, national and international conferences. Upon receiving her master's degree during the spring commencement ceremony in May, Spagnuolo plans to work in her field of study before enrolling someday in a Ph.D. program to continue her education in the communication sciences. For more information about Misericordia University's master's degree program in speech-language pathology, please call 570-674-6400 or visit www.misericordia.edu/slp. 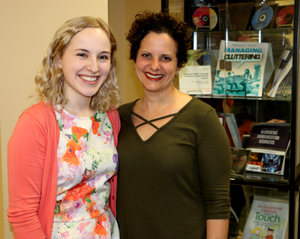 Danielle Spagnuolo of Wyoming, left, a speech-language pathology graduate student at Misericordia University, poses with her faculty mentor, Professor Cari M. Tellis, Ph.D., C.C.C.-S.L.P., after she received the 2019 Von Drach Memorial Scholarship from the Pennsylvania Speech-Language Hearing Association at the 60th annual convention in Lancaster in April.